The Programme for International Student Assessment (PISA) is a triennial, global test of fifteen-year-olds in mathematics, science, and reading abilities taken alongside a questionnaire about their school experiences. The assessment also surveys principals about their students’ learning environments, from the physical location of the school to the activities offered. Since the test’s first administration in 2000, the Organisation for Economic Co-operation and Development (OECD) has collected PISA results from millions of students representing seventy different countries and economies. OECD last administered PISA in 2012, and the United States, compared to other OECD nations, performed below average in mathematics and average in both reading and science. 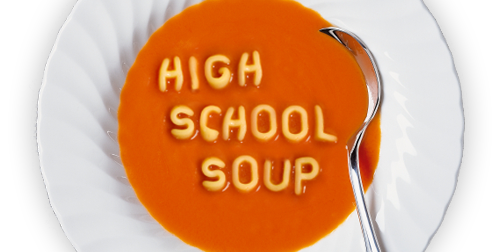 In the four years since then, further analyses of the assessment have shed light on some issues pertinent to the United States, especially with regards to student perseverance, school environments, and financial literacy. Student perseverance affects mathematics performance. The 2012 PISA surveyed students’ ability to persist when faced with challenge and found that perseverance is associated with performance on the mathematics section of the exam. The OECD reported in May 2016 that low mathematics performers (those who scored below Level 2, which according to the OECD is “the baseline … proficiency that is required to participate fully in society”) were 19 percent more likely than their peers to respond that they would give up on solving problems. Low mathematics performers also responded that they were not reaping the benefits of their efforts. For example, although low mathematics performers reported studying course material and participating in mathematics-related extracurricular activities to a similar degree as their peers, they were 25 percent more likely to feel unprepared for quizzes or exams. The United States needs to improve its efforts to build better school environments. Qualities such as perseverance, the OECD states, “are malleable and can be influenced by the circumstances individuals encounter and the opportunities that they are given.” Fortunately, on average school environments have improved globally, providing more access to physical resources (e.g., textbooks, laboratory manuals, computers) as well as quality teachers who form better relationships with their students. The 2012 PISA also examined students’ sense of well-being and found that about 80 percent of students agreed or strongly agreed with the statement “I feel happy at school.” The U.S. student happiness index (79.7 percent) matched this OECD average. However, this seemingly high proportion masks a few underlying concerns. First, U.S. students are less likely to report feeling happy at school compared to those from other developed nations like Japan (85.4 percent), Switzerland (87.1 percent), and Norway (86.9 percent). Second, 71 percent of OECD students attend schools where the principals agreed that their teachers foster social-emotional development as much as academic achievement. In contrast, only 64 percent of American students attend schools where the principals reported having that perception. 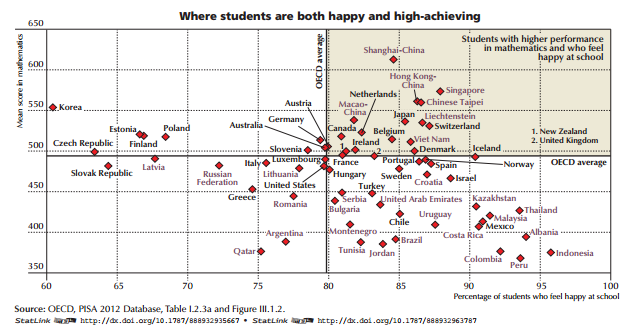 The graph below plots, for each nation, the percentage of students who agreed or strongly agreed with the statement “I feel happy at school” against average PISA mathematics scores, with the X- and Y-axes representing OECD averages in each measure. Nations and economies, like Singapore, that land in the shaded upper-right quadrant represent those with the highest-performing and happiest students. The United States falls approximately where the axes intersect, highlighting the nation’s room for improvement. American students lag behind their peers in financial literacy. 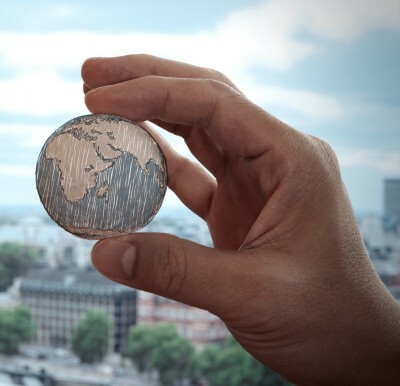 Eighteen countries and economies, including the United States, participated in an optional assessment to examine students’ knowledge and application of bank statements, loans, insurance, and other financial documents. The United States ranked around the OECD average in terms of absolute score, percentage of lowest performers, and percentage of top performers. However, underlying figures once again reveal much more about U.S. performance. OECD dictates that Level 2 is the “baseline of financial literacy proficiency … essential for full participation in society as an independent and responsible citizen.” Forty-four percent of U.S. students performed at Level 2 or below, compared to 38.2 percent of OECD students. Although the results did not reveal a significant gender gap in financial literacy, immigrants and students from low-income families across all OECD countries and economies tended to perform worse. Ji Soo Song is a policy and advocacy intern at the Alliance.